TURBO-CHARGE your FOCUS, enabling you to BLAST through your work at LIGHTENING speeds! BOOST the HAPPY CHEMICALS in your brain, seriously improving your mood and making you feel great! TRIGGER the ultimate in mind & body RELAXATION, allowing you to enjoy the absolute best night’s sleep you’ve ever had! That switch is available – RIGHT NOW. 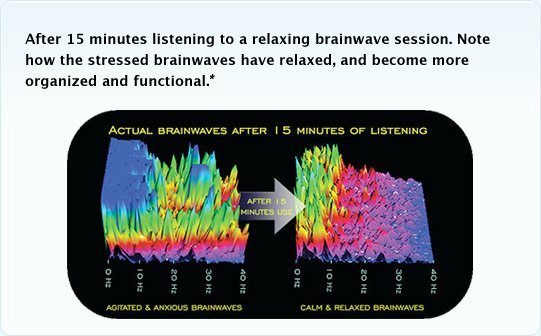 The Brain Salon is a scientifically-proven MP3 series that uses specialized sound patterns to CHANGE your STATE. In JUST 30 MINUTES, it can recreate absolutely ANY state of mind – including total focus, complete happiness, thorough relaxation, deep sleep, heightened creativity – and MORE. It’s completely 100% safe – and incredibly SIMPLE to use. Or click below to play our two-minute welcome movie. A control panel that allowed you to CHANGE your state of mind at the click of a button, giving you unprecedented CONTROL over your state, feelings and emotions. How would that COMPLETELY change your life? How many times has being in the ‘WRONG STATE’ held you back in life? You’re trying to study, but your mind is elsewhere. You keep getting distracted, you can’t stop fidgeting, and you’re getting NOTHING done. You’re desperate to FOCUS – but CAN’T. You’ve had a rough day at work, and are supposed to head out for the evening. But you can’t shake off that grouchy feeling and get into that happy, peppy mood that others associate you with. You’re desperate to IMPROVE your MOOD – but CAN’T. You’re in bed at night, with a big event happening tomorrow. You NEED to sleep – but you’re spending hour after hour, turning in bed, your mind racing, completely unable to relax and dive into slumber. You’re desperate to get to SLEEP – but CAN’T. With the Brain Salon, you can QUICKLY and EASILY turn around ANY of these situations – and many others too. In just MINUTES, you can change your entire state, feelings and emotions, just by slipping on a pair of headphones, and chilling out. But just WHAT is the Brain Salon? The program was developed at BrainEv Labs by brainwave specialists Craig Tice and Joe Verona – and comes from Inspire3, the same group that brought you the world-famed Brain Evolution System. Many thousands of people know that the Brain Salon delivers AWESOME RESULTS. It’s a science that is backed by over 100 years of research, and is 100% safe. To learn more about the research behind the Brain Salon, click here. Are YOU ready to start controlling your state? Would YOU like to discover the SECRET KEY to changing how you feel – just by hitting the “Play” button on your MP3 player? The Brain Salon contains six POWERFUL sessions for bringing about EVERY major state of mind – in just 30 minutes. Get ready to chill out, with this deeply relaxing and re-energizing session. You’ll return from the session feeling incredibly tranquil, recharged and grounded – with a big improvement in your mood, too! Whenever you need a break from a stressful situation, whenever you get home from work, whenever you just want to really recharge those batteries – this is the session for you. Switch on your imagination, and dive into genius with this inspirational session! You’ll return from listening brimming with ideas, thoughts, concepts, and solutions – with fresh mental connections you never before considered. Whenever you need a little inspiration, whenever you want to nd that impossible solution, whenever you’d like to see your mind think like a creative genius – this is the session for you. Prepare yourself for the best night’s sleep – ever! You’ll probably never hear the end of this session, as it gently guides you into a deep, reinvigorating slumber. Whenever you just need a really great night’s sleep – this is absolutely the session for you. Get ready to switch on your mind – and conquer the world! You’ll love the awakened buzz and general pick-me-up feeling this session gives – the perfect antidote to a lethargic mind. It’s morning caffeine in audio format! Whenever you want to speed up your thinking, whenever you need that physical and mental edge, whenever you need to sharpen your presence – this is the session for you. Enjoy a brilliant boost in your mood – with this digital happy pill! Find yourself reveling in the beauty of life, letting go of all problems and stress – and just generally being a brighter, better, happier, more fun self! Whenever you want to cheer up before a big day, whenever you want to release stress and problems, whenever you want to really boost your happiness levels – this is the session for you. Instantly switch your mind to laser-sharp focus mode – and get on with the task at hand with absolute speed and clarity. Perfect for getting through big chunks of work, complex studying periods, or any activity where intense attention is required. Whenever you want to put your mind into super focus mode, whenever you have intense chunks of work to complete quickly, whenever you need to sharpen your brain and get on with the job – this is the session for you. Can you IMAGINE possessing this level of MENTAL CONTROL? Think about being able to consciously decide EXACTLY what your state of mind will be at any one time – just by listening to a simple audio recording! Copy the audio MP3s direct to your iPhone or MP3 player, or burn to CD and pack them whenever you travel. You’ll ALWAYS be ready to change your state, whenever you desire. With the Brain Salon, YOU are in control of YOUR mind. This is your mind’s instruction manual, your cerebral control panel. It’s your SECRET WEAPON in performing better than EVERYBODY ELSE. And we GUARANTEE that you’ll love it. Our guarantee to you is SIMPLE. We promise that you’ll be absolutely ECSTATIC about how the Brain Salon will change your life. Within days, you’ll find yourself amazed at the results, and wonder how you ever lived without it! That’s our SOLID, 100% GUARANTEE – backed by Inspire3, the developers of the Brain Evolution System. We’ll even give you a WHOLE TWO MONTHS to make up your mind! If you’re not ecstatic for ANY reason at all, don’t worry. Just let us know within 60 days, and we’ll refund every single cent you paid. NO small print, NO hidden costs, NO questions asked. It’s absolutely RISK-FREE for you. That’s how confident we are that you’ll love the results you get. Ready to discover the power of the Brain Salon? Let’s discover precisely what you’ll get when you decide to order YOUR copy of this amazing program – TODAY. The COMPLETE Brain Salon User Manual – Your total guide to getting started with the Brain Salon, including a full introduction, and technical overview of every session in the series. Everything you need to know – and more! PDF format. TOTAL 100% Money-Back GUARANTEE! – Try out Brain Salon for a whole 60 days, absolutely RISK-FREE. If you’re not completely thrilled with the results, just let us know and we'll give you a FULL refund. Easy! Order TODAY and we’ll also include BONUS MP3 recording with the original Brain Salon developer, Craig Tice, as he explains how the program was put together, and how best to use the sessions within it. It’s time for YOU to discover the Brain Salon. - ALL for two tiny installments of just $147 - $127 - $77. That’s less than a couple of nights in a flea-ridden motel. And for that tiny price, you’ll possess the SECRET POWER of being able to completely change your state and mood – IN 30 MINUTES, or less! Or you can pay in one SINGLE INSTALMENT, and pay EVEN LESS – all for exactly the same package! Select one of the options above NOW - to begin the purchase process. Well, that’s all for now. We urge you to download your copy, while this program is still available. Get ready to discover the awesome power that is the Brain Salon! PS. Remember, we have LIMITED DIGITAL STOCK of the Brain Salon! We’ve warranted that we will only provide this release to 1,000 customers worldwide. And when that counter hits, you WILL NOT be able to purchase anymore. So you MUST take action now if you’d like to discover Brain Salon for yourself! PPS. The Brain Salon is NOT available anywhere else! We don’t retail in-store, via television, online at Amazon, eBay, or any other website. You can ONLY purchase the Brain Salon from THIS WEBSITE. That means if you’d like to discover the Brain Salon, you MUST do it HERE – now! PPPS. Don’t forget our 100% MONEY-BACK GUARANTEE! We promise that you’ll love the Brain Salon. If you don’t, we’ll return every single cent you paid. And you get a full two months to try it out for yourself, too. Go on. Find out what all the fuss is about. Discover the Brain Salon for yourself, TODAY! “I have had a good try of the Salon series with great results. “All the audios are very pleasant and unique sounding, different from what I've experienced in the past. I was extremely impressed at how well each one worked. “I'm now writing sales copy and the 'Creativity' audio has really helped the flow of ideas, and even the most complex thoughts seem to connect easily with clarity. Usually I would have to do my best to grasp onto ideas whilst I am implementing them. This session alone is worth the asking price! “The other morning I woke up feeling really foggy. After an hour or so, I remembered the 'Espresso' audio and decided to give it a go... It was a perfect lift me up and seemed to clear that heavy tired feeling straight away! “The 'Happy Pill' audio is interesting and I was expecting some bouncy music, but instead it was beautiful, almost healing music that left me feeling at peace with a smile on my face and love in my heart.